I once saw an interesting math challenge: Assume X and Y are randomly chosen numbers, with each being equally likely to be any number between 0 and 1. Take Y/X and round to the closest integer. What is the probability that this number will be even (or odd)? It turns out this problem involves using the a ratio distribution. I felt that Wikipedia’s page on this subject was very poor, at the very least certainly unintuitive, so I hoped to come up with a more intuitive explanation. It occurred to me that problems like this can be shown graphically. 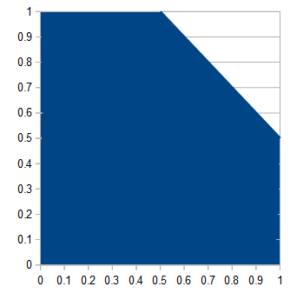 Because X and Y are between 0 and 1, you can plot (X,Y) in a unit square. Because they are uniformly distributed there, and the area of the square is exactly equal to one, the probability of getting any collection of points is exactly equal to the area of that collection. 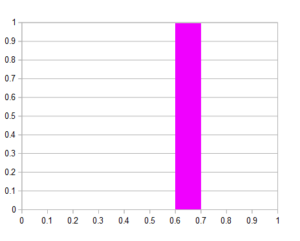 Example, suppose you want to find the probability that x is between 0.6 and 0.7 (and you don’t care what y is). The region described by that is a rectangle with area of 0.1. Therefore, the probability of that result is 0.1. 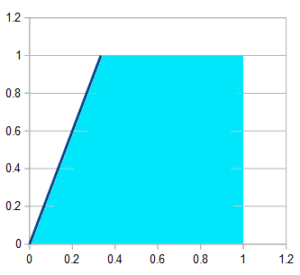 If you want x to be between 0.6 and 0.7 and also want y to be between 0.1 and 0.3, the area of that region is 0.02, so that is the probability of that result. However, this general idea can find the probability for more complicated relations between X and Y. Say we want to know how to describe X+Y — what the probability of getting some S = X + Y is. If X + Y = S, then Y = S – X. This is the equation for a straight line. Furthermore, If X + Y <= S, then Y <= S – X. 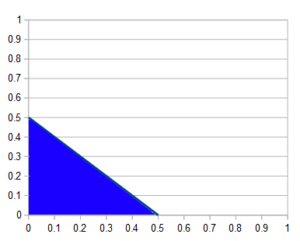 The probability of getting some value for X + Y that is less than X will be the area under the line Y = S – X. 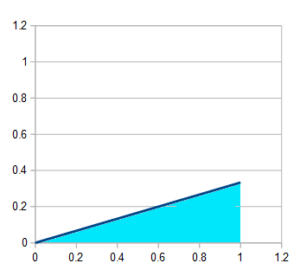 The below figure shows what this area would look like if S = 1/2. However, this is only true if S < 1. If 1 < S <2, the area is the whole unit square with a triangle taken out of it. 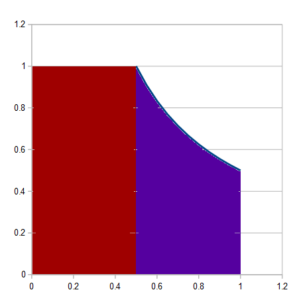 The below figure shows the case for S = 1.5. We can find the probability distribution by differentiating the cumulative probability by S.
This probability distribution is graphed below. What about the product S = X * Y? 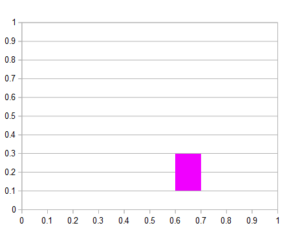 Consider the case X * Y < 1/2, graphed below. Note that while log(0) is negative infinity, the limit of S log(S), as S tends to zero, is zero; so the cumulative probability that X*Y is less than zero is of course zero. If S>1, things change. 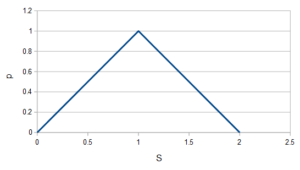 The below graph shows the case for S = 3. Going back to my criticism that Wikipedia’s article explains this poorly, they have this result, but they certainly do not give a simple, intuitive reason why the functional form of the probability density changes when S passes 1. In this derivation, the explanation is very simple: The line Y=SX passes the corner at (1,1) when S passes 1. Now we are able to answer the question that kicked off this thread: If you take Y/X and round to the nearest integer, what is the probability that that integer will be even? This is because, if the result is between 0 and 1/2, we round it to zero (even); if the result is between one and one half and two and one half, we round it to two (even); and so on. So, we need to find the sum of all such probabilities. Not only is the probability of getting an even number not equal to 50% (though 46.46% is sort of close), it surprisingly even involves the irrational number pi, which is especially surprising since people tend to think of pi as relating to circles. There is well known problem, Buffon’s needle problem, which includes a factor of pi in a probability, but in my opinion that is much less surprising, since Buffon’s needle problem is obviously geometrical. Next time, we’ll use similar graphical methods to solve a more complicated, and maybe more interesting, probability problem. This entry was posted in math, probability, Uncategorized by admin. Bookmark the permalink.